Spectacular Yellowstone and Grand Teton National Parks captures the breathtaking landscape and wildlife of one of America's most renowned regions. More than 275 photographs--from some of the country's best nature photographers--recreate the adventure and grandeur of this area that combines the world's greatest collection of geothermal features, some of the West's most spectacular mountains and its best wildlife viewing areas. 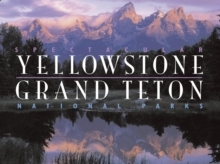 This unique large-format book offers guided tours--in words and pictures--of Yellowstone and Grand Teton, with thirty-six pages of foldouts, each more than three feet wide, designed to illustrate the wide-open expanse of these national park gems. Yellowstone was set aside as America's first national park in 1872. Since then, interest in the park has grown dramatically and today, more than 3 million people visit the two parks annually. Grand Teton National Park, home of the majestic mountain range, was preserved as a national park in 1929. This book offers stunning photographs of every corner of the 2.2 million acres that make up these parks, including such treasures as Lake Yellowstone, the Grand Canyon of the Yellowstone River, and the world's most famous geyser, Old Faithful, as well as rainbow-colored geyser basins of the north Mammoth country, and herds of buffalo and elk on the wide plains of the Lamar Valley. Sit back and behold the beauty of the Grand Tetons at sunset, the breathtaking vistas over the Snake River, or the refreshing waterfalls off the Bechler River trail. Whether it's boating on Jackson Lake or a hike around Grand Prismatic Spring that you desire, Spectacular Yellowstone and Grand Teton National Parks takes you deep into the parks' many gorgeous landscapes in every season of the year.